The most original, inviting, useful and sonically interesting Melda plugin yet, and one of few we'd advise everybody to try. Easy to use. Versatile. Sounds amazing. Melda's Random modulator is particularly effective here. MeldaProduction plugins have a reputation for powerful features and unique results, though they're not always exactly user-friendly. It's a pleasant surprise, then, to find that its latest, MMorph (VST/AU/AAX), features a modest control set and minimal learning curve. MMorph morphs (that is, progressively merges, as opposed to simply mixes) one signal into another. Insert MMorph onto one channel (A) and send another signal to its sidechain (B), and it instantly combines their sonic qualities by analysing characteristics common to both. Melda is cagey about the details, but we do know that envelope followers are involved. The big Ratio knob controls the morphing - again, specifics are scarce, but it seems to set the crossover between common elements of the signals, often with fairly abrupt changes over a short distance of travel. Up to eight shaping processes can be applied to each channel pre-morph. Compression acts on relative frequency levels, amplifying quiet frequencies and attenuating loud ones. Tone controls a high-shelf filter. Flattening (A only) is similar to Compression but only amplifies quiet frequencies where they occur near loud ones, while Whitening (B only) amplifies only frequencies that are present for a short period of time. Harmonics additively generates harmonics from the signal. Attack and Release control the main envelope follower portion of the morpher; Gain sets the level for each channel; and Gate defines a volume level above which the signal has to go to be heard. At the click of a button, the two input signals (channel in and sidechain) can be swapped to take advantage of their differing controls. You can also ditch the sidechain and instead use the left and right stereo channels for A and B, or even two versions of the same signal. The level of the morphed audio (Wet) and the dry signals for channels A and B can all be set independently, while the Formant Shift control for signal B can be used creatively but is intended to aid in matching the spectrum ranges of the two signals for more sonic commonality, which has a big influence on the resulting morphed signal. The Output section enables further Compression, Flattening, Attack and Release shaping to be applied to the main output, while the easy-to-use modulators bring even more movement to the party. 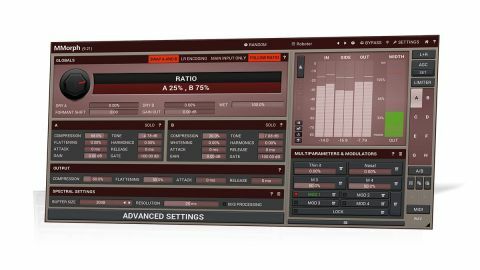 Then there are Melda's ever-present Multiparameter macros, as well as all the other staples like mid/side and surround processing, clear metering, the famous intelligent randomise facility, an output limiter, automatic gain compensation and MIDI learn. Oh, and a bank of 63 excellent presets. Using MMorph's unique processing, you can get truly amazing results blending, for example, bass with vocals; synth chords with FX; and just about anything with drums. You can even use it to blend two complete tracks. Our only criticisms are the same as we always have of Melda plugins: the GUI is ugly, the manual is poor, and it's quite pricey. Nevertheless, sound designers and electronic music producers of all kinds absolutely must try the demo.